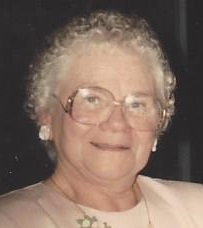 FULTON, NY – Jane M. Seaburg Woeller, 96, of Fulton, passed away on Saturday, July 16, 2016, at St. Luke Residential Health Services in Oswego. She was born in Oakfield, NY, on April 15, 1920, to the late Carlton and Marguerite Seaburg. Jane graduated from Oakfield High School in 1937 and married her husband, Kenneth Woeller, on November 21, 1940, which was Thanksgiving Day. Jane and Ken loved to dance and belonged to many square and round dancing clubs in the area over the years. She lived in Fulton most of her life and was a past president of the A.L. Lee Memorial Hospital Auxiliary and the P.T.A. at Lanigan Elementary School and the former State Street Elementary School. Jane was an active member of the Fulton Women’s Club, the Fulton Women’s Garden Club and State Street United Methodist Church. She also taught adult education sewing classes for many years and served as a Cub Scout Den Mother and Girl Scout Leader when her children were young. She was predeceased by her husband, Kenneth N. Woeller; son, Kenneth N. Woeller Jr.; brother, Carl Seaburg; and sisters, Rheta Atherton and Betty Rowe. Surviving are three daughters, Sandra (John) Benny of South Wales, NY, Diane (Al) Houghtaling of Decherd, Tenn. and Dawn (Mark) Colomb of Proctor, Vermont; a son, Richard (Sandra) Woeller of Chapel Hill, NC; daughter-in-law, Judy Leypoldt of Las Vegas, Nev.; 16 grandchildren, Rick (Kara) Woeller, Laura (Dan) Hill, Matt Benny, Jennifer Woeller, Kenneth Woeller, Kristin (Ryan) Campbell, Jeremy (Kayla) Woeller, Stephen Leypoldt, Sarah (John) Adkerson, Joshua (Becky) Houghtaling, Elizabeth (Brandon) Jones, Mary (Chuck) Halliburton, Becca (Ryan) Massengill, Ben Houghtaling, Meg Ricci and Gianna Ricci; 29 great-grandchildren, Gwyn, Gretchen, Quinn, Ian, Marley, Joshua, Kameron, Karsen, Jordanne, Kailee, Lily, Owen, Cody, JayTee, Justice, Izabella, Makayla, Briana, Landon, Ava, Jordon, Andrew, Nathaniel, Kaden, Levi, Bailey, Brantley, Rylee and Payton; and several nieces and nephews. Foster Funeral Home, Inc., in Fulton, has care of arrangements. Memorial contributions are encouraged in Jane’s honor to State Street United Methodist Church, 357 State St., Fulton, NY 13069.